With this product, you earn 27 Reward point(s). 27 points = $0.27. Schizandra berry tea is a delicious and fruity tonic tea made with, the Chinese tonic herb, Schisandra chinensis. Schizandra is also called Wu Wei Zi or "five flavored berry" because it contains all of the five tastes: salty, sweet, bitter, astringent and sour. It is one of the great super fruits and major tonics in Traditional Chinese Medicine often prized alongside ginseng, goji and reishi. It has been used in Chinese herbalism since the beginning of their civilization and was highly valued by Taoist masters and revered throughout history by emperors and the ruling elite. One of the qualities that makes this berry truly unique is that it is able to tonify all 3 treasures (Jing, Shen and Chi) as well as enter all 12 meridians. In Chinese folklore schizandra berry tea is said to "calm the heart and quiet the spirit" and works specifically with the lungs, brain, kidneys and liver, acting as both a yin and yang tonic. Schizandra berry tea has been used also in Russia for centuries to increase energy and was used by the Nanai people on hunting excursions to improve night vision. We have experienced first hand schizandra's benefits as a "runners tonic." Attesting to the power of this super fruit to, not only increase endurance levels, but also to improve ones overall experience. A "runner's high" can be increased 10-fold, when consuming schizandra berry tea on a regular basis. It has been described as "gliding effortlessly through the air" and is an exceptional Chinese tonic for anyone who runs regularly or performs marathons. Schizandra has been used by professional athletes around the world to improve physical stamina and skill in competitive sports activities. The tea is energizing yet calming to the body and in some cases it can be mildly sedating. Because it is an adaptogen it tends to promote the best pathway for each individual, either stimulating or sedating depending on what is needed to replenish or activate the body. Schizandra is thus a great superfood or tea for those who suffer from nerve debilitation, chronic fatigue or adrenal exhaustion and can be a great energy restorative for such individuals. According to the Journal of Ethnopharmacology "studies on animals have shown that schizandra increases physical working capacity and affords a stress-protective effect against a broad spectrum of harmful factors..."
Schisandra berry tea has been prized for its amazing health benefits since it was first used in ancient Chinese medical practices. This tea can be used for a wide variety of purposes. Though some benefits are medically unproven as yet, others have withstood scientific studies aimed to determine just how schisandra tea benefits the body. This tea produces an enzyme known as glutathione peroxidase that acts to deactivate toxic free radicals in the liver. This may help to heal certain types of liver damage. Ancient Chinese emperors revered schisandra tea for just this purpose. This tea also prevents inflammation of the liver. Other schisandra tea benefits help to balance the mood and aid in mental stability. 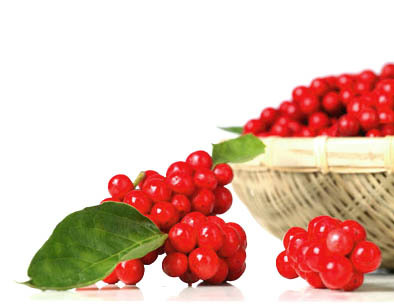 Schisandra tea is often used as a treatment for depression or a variety of stress-related illnesses. This tea balances a variety of mental functions. Patients who are depressed will notice their mood stabilizing. Those dealing with an excessive amount of stress will find that it is easier to deal with and takes less of a toll on the body. Schisandra berry tea can make you feel stronger and more energized. It also helps to increase mental focus, clarity and memory. Schisandra tea may even reduce physical exhaustion. Schisandra tea benefits many of the body’s systems, helping to increase their functionality and enhance balance throughout the body. Schisandra berry tea is believed to benefit the immune system, respiratory system, digestive system, central nervous system and reproductive system. Patients have reported that this tea makes it easier for them to sleep, increases their physical stamina, and makes it easier to focus and work on a variety of projects for longer periods of time. If you’re feeling generally under the weather or suffering from even mild depression, you may find that a regular dose of schisandra tea alleviates your problems. We usually always combined the berries with goji berry when decocting (simmering) them as a tea. When making schizandra berry tea you should simmer it for only 15 minutes as extended cooking times tend to release tannins, creating an overly tart and astringent tea. Unlike other tonics, such as ginseng, the berries should be dis-guarded after use and not re-used. Simmer the above ingredients in one quart of pure water for no longer than 15 minutes. Strain and drink alone with super sweeteners or allow to cool and blend into a smoothie or iced drink. When doing the 100 day ritual you can omit the astragalus and add 4T schizandra instead of 3T, but include the other ingredients as they work to activate schizandra's tonic properties. For other options you can also decoct schizandra with cleansing herbs, like dandelion root, that also work specifically to detoxify the liver. Wash 2tsp of herbs on running water; Soak overnight in 2L water.